fall, when the air is cooler and the kids have returned to school. 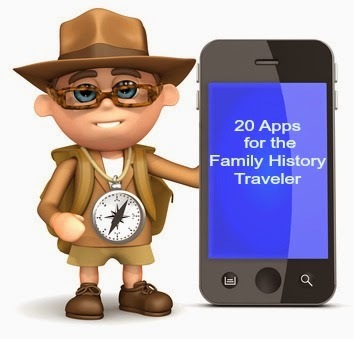 Regardless of when your next adventure is booked, be sure to check out our list of travel apps for the family history traveler. Now I’m not implying you need 20 apps to travel but there are a few options in each category depending on your needs. Apps should make life easier and take some of the stress out of traveling. Here’s 20 I think can definitely help the family history traveler. Take Your Research with You – A family history travelers first priority is to the research. It’s important to be able to carry our research with us. Gone are the days of lugging books and binders. There’s an app for that, actually several apps that can make this happen. 1. Ancestry.com –powered by the leading family history website, this app allows you to keep your ancestors close and their information closer. Here’s my personal experience with the app. 2. RootsMagic –my favourite family history software has an app. If you store your family history research in this popular program you can conveniently carry your genealogy with you on your Android or iOS device which includes iPhone, iPad, and iPod touch, all for free. 3. My Heritage- also offers an on-the-go version of their popular family history website. You can view and edit your tree, add people and search the My Heritage website. My Heritage supports 32 languages. 4. Evernote – I turned my Evernote app into a travel app, carrying my research checklist and all necessary information specific to each research trip. If your current family history software doesn’t provide an app consider Evernote. Read about how I turned Evernote in my personal travel app. Capturing Research During Your Trip – A big part of a family history trip is securing new information. The right app can make it so much easier to not only record but keep organized as you move through your research trip. 5. My Interview for recording interviews on your iPad. Whether it’s with a local historian in an archives or a family member interview, this app will make your life incredibly simple. Allows you to upload multiple question templates, take notes during and after the interview. Evernote – Not only can you bring your research with you but save new research as well. Evernote is perfect for saving your hand-written notes, pictures of documents, artifacts or pages out of books. I take pictures of pages, notes, artifacts, signs, you name it, I grab a photo of it and save it right to my designated file that I created before I left home. You can also make notes right in the app or on paper and then capture it in a photo to Evernote. 6. History pin – This app allows you stand in the streets of your ancestral hometown and link your personal family history and photos to a larger story and pin it to Google Maps. You can overlay a historical image with a modern view to create a historical comparison. It allows us to answer the question what was here before? What did our ancestral world look like and what remains that you can connect to today. Currently Historypin houses over 100,000 pins, contributed by over 150 cultural heritage institutions and tens of thousands of individuals. 7. It happened here - brings a city's past to life by providing descriptions of the most interesting events that have taken place at or near a user's location. The initial cities offered are New York, NY, Los Angeles, CA, San Francisco, CA, Boston, MA, Chicago, IL, Philadelphia, PA, New Orleans, LA, London, UK, Washington, DC and Dallas, TX. These events are manually researched and written by the company so there is no user-generated content on this app. 8. Field Trip App - is from Google and runs in the background on your phone. When you get close to something interesting, it pops up a card with details about the location. No click is required. If you have a headset or Bluetooth connected, it can read the info to you. Field Trip can help you learn about everything from local history to the latest and best places to shop and eat. Maps and Travel Guides – are an essential part of travel, but paper maps, really? Not with these great solutions. All work offline so you don’t need to rely on expensive roaming and data fees. No more getting lost trying to find that cemetery. 9. Trip Advisor Offline City Maps – This free app provides maps with guides to restaurants, attractions hotel and reviews, all stored in the app so you can access them offline. You can follow self-guided tours created by experts, select a destination and the app will guide you using your phone GPS. 10. City Guides Offline Maps – produced by the folks at Stay.com. This free iPhone app allows to find your travel destination and create an itinerary for what you might want to see, do and eat. You can plan your trip from the app or from the website and import it into the app. As the name suggests it provides offline functionality including maps. 11. Museum Mobile - features thousands of the world’s biggest museums. Learn about what they house and current collections. Using your GPS the app will point you to the nearest museums in your area. Who knows where this one will take you? The downfall, only currently available for Windows Phone. Organizing Your Trip- Getting out the door and sticking to a schedule can sometimes be stressful. These apps will help you pack, create an itinerary and move through the airport like a pro. 12. Gate Guru – can take the stress out of the airport. Gate Guru allows you to get familiar with an airport before you arrive. It keeps an eye on your flight, any changes or delays. Gate Guru finds restaurants, watering holes, washrooms and other services within the airport. You can also book a rental car with Avis through this app. Just for the fun of it, Gate Guru tracks your travel miles and airports visited. Gate Guru can help you navigate any airport you find yourself in. 13. Packing Pro –If you’re a list maker you’re going to love this app. Rated as one of the best travel apps it comes in a free option called Packing or the paid version Packing Pro. The Packing Pro looks like its well worth the couple of bucks especially if you’re packing for multiple people. Packing Pro creates customizable packing lists, with a variety of multi-item sections and categories, monitors a running tally of total items and the ability to check them off as you go. Print your list or email to friends and family, you can even add those last minute reminders like watering the plants. Only thing it doesn’t do is the actual packing. Too bad! 14. TripIt – organizes your travel life, everything from itineraries, reservations, numbers and schedules. You can forward travel-related email to your TripIt account; the app will create a calendar for you. The app also provides maps, weather forecasts and restaurant suggestions and attractions. 15. Passbook – already on your iOS phone, this little app is completely under used by most travelers. Passbook provides you with a place to keep all your tickets handy. Everything from airline boarding passes, to concert and theatre tickets to movie ticket and sporting events. You can also keep reward cards organized in Passbook. As more and more businesses start using it you’re going to be able to carry fewer and few cards in your wallet. Languages and Money – Traveling to your ancestral homeland is most likely going to find you confronted by a new language and currency. Here are a couple of apps that will make it a little bit easier. 16. iStone is designed for the iPhone, iPad and iTouch and offers more than 300 daily phrases in 12 different languages. You can add new phrases and recordings; it can be used offline, no Wi-Fi or data required. There is both a free and paid version. 17. Wikitude is in fact a browser. It uses the camera in your smartphone to view the neighbourhood you’re visiting and information will appear on the screen. It connects you with restaurant reviews from TripAdvisor and Yelp, along with photos and tweets about the same location, from friends in your social network. Another really cool thing. It doubles as a currency converter. Scan your bank note and the app converts it into multiple currencies. Travel Safety – Traveling sometime meets with accidents. Here are a few apps to help you deal with those misadventures. 18. First Aid by American Red Cross- We have all encountered the occasional mishap while on vacation, from blisters, (should have broke in those shoes before you left) and sprains (tripping in the cemeteries) this app has you covered. Regardless of whether you are travelling or not this is just a great app to have. It’s available for free on Android and Apple. 19. bSafe - is a personal safety app. It’s built to help keep you secure on the road or at home. You set up a personal network of friends and family and it sends out notifications of your location using GPS. It you don’t arrive at a set destination the app will send out an alert to your network. It even has an alarm you can trigger that transmits a siren sound and records a video. Available for free on Android and Apple devices. 20. Travel Safe – Everyone knows 911 in Canada and U.S. for emergencies. But what would you dial in Paris, or London. The Travel Safe app features a list of emergency numbers for your location easily accessible on the home screen. The app will detect your location to access medical, fire and police number. No Wi-Fi required. You can also add a custom list of emergency contacts and personal information for emergency responders. Great value for .99 cents, and available for Apple or Android. 21. What’s a trip without sending a few postcards? But gone are the days of the cliché postcards. I always buy them but never get around to sending them, I’ve solved that problem with Postagram allows you to turn your photos into postcards that you mail right from your smartphone. That’s my list, do you have an app you like to use for family history travel. I’d love to hear about in the comments.